(Barbara’s photo) It weighed eight pounds! Our largest sweet potato this year weighed two and a half pounds, which is only half Barbara’s record of five, but really quite large enough. We love digging for an audience, especially those kids who are curious about where their favorite foods come from. And actually we don’t mind at all explaining all day long that potatoes and sweet potatoes are from entirely different plant families, and that they grow differently, and are planted at different times of the year, potatoes in March from pieces of guaranteed disease-free seed potato (please do not use store-bought) in a trench gradually filled in with soil over growing plants which will die back in the summer, and sweet potatoes in late May or whenever it’s warm from plant slips on top of a loose bed of soil from which those lovely vines will spread out until frost. And yes, you can eat sweet potato stems and leaves (we just learned about the stems this time around from our visitors). 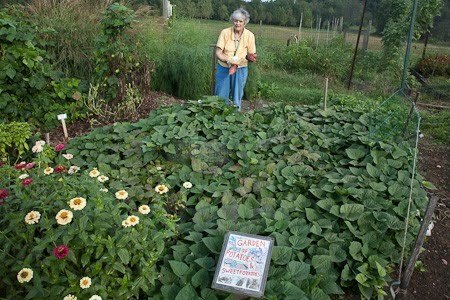 (photo: Katherine Lambert) No, those are zinnias over to the left, but sweet potatoes have nice flowers too. You can’t really see it in the middle of the vines, but the original slips were planted inside a cage of hardware cloth buried several inches in the ground to keep out mice and voles. And lo, when we dug up the tubers that had grown just outside the cage, they had been chewed partially away. I think our resident chipmunks were having a feast as well, even inside the cage. But it does a good job keeping out most furry pests. Insects are not much of a problem. The cage was an oval about five feet long, and the whole garden area is about eight by ten feet for six plants, but if you’ve got less space you can still grow a plant or two and get a nice harvest in the fall. You can grow sweet potatoes in a pot! And they’re pretty. Nice groundcover, if temporary. 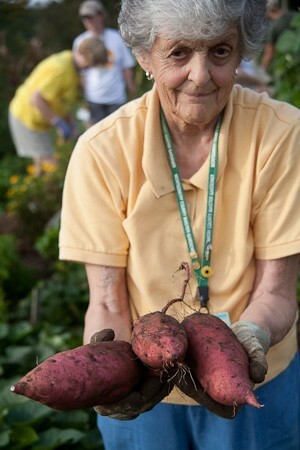 Barbara says have a sweet potato. You know you want to. Great article! I have never grown sweet potatoes before. This makes me want to try them next year. They're really so easy to grow and tremendously rewarding. Definitely give them a try! 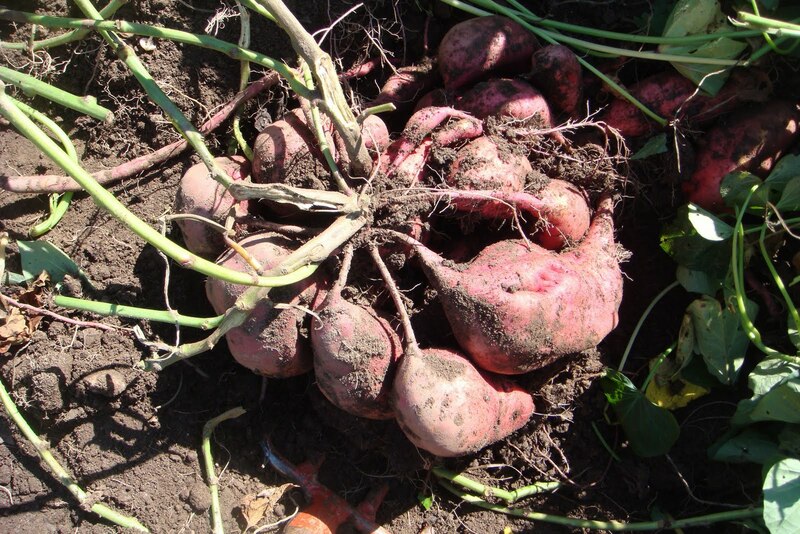 Sweet Potatoes take a long summer to produce. So, get your slips as early as possible. There's some difference in how long varieties take to develop from planting to harvest, but 90-100 days is about average and that works well for our climate. You want to order the slips early to make sure you get the type you want, but be sure not to plant until all chance of frost is past and the soil is warm. Can you please let me know when to sprout the sweet potatos indoors in Marylnd? If you plan to put the slips in the ground around June 1 I would start them indoors around April 1. They are slow to sprout and grow indoors (especially in a basement).